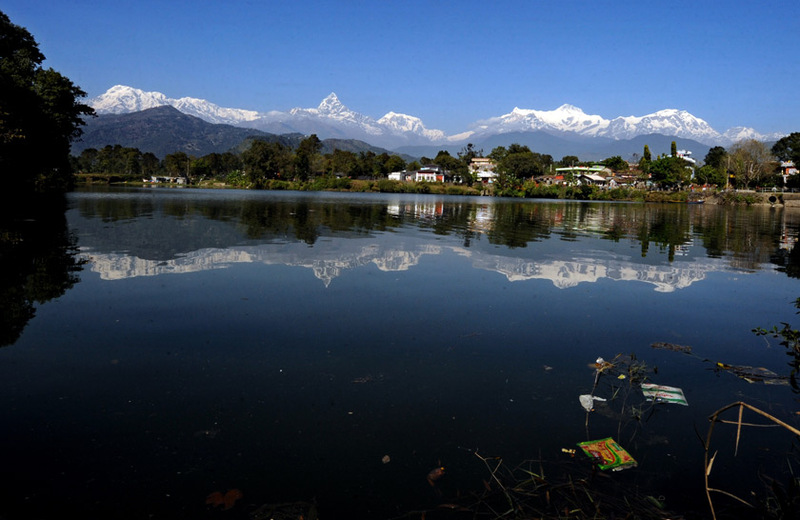 POKHARA, Jan 28: The existence of Fewa lake is in jeopardy due to the continued encroachment of its land. Gandaki Provincial Assembly member Rajiv Pahari believes that a recent Supreme Court order to clear all illegal structures along the shores of this lake is a 'jiwanbuti' (life-saving drug) for this major tourist attraction in the country. Pahari, who has been fighting for the conservation of the lake, has shared some of the ways to conserve the lake. Also a member of an 11-member committee headed by the Provincial Minister for Industry, Tourism, Forest and Environment Bikash Lamsal to implement the Supreme Court verdict, Pahari gets nostalgic to his childhood days when the lake was in its original form. “We grew up drinking water from the Fewa Lake. Our family members, neighbors and entire residents of Baidam grew up drinking water from the lake. Now neither the water of this lake is pure, nor is its existence safe from danger,” laments Pahari. Pahari expressed concern over the growing encroachment of the lake day by day. “If we act like mute spectators to this encroachment and choose to do nothing about it, our future generation may have to read about the Fewa Lake only in textbooks. We must conserve this to avoid that from happening,” he said. Pahari said he has already shared his plan for the conservation of the lake with Chief Minister Prithvi Subba Gurung. Pahari also believes that much more can be done if a separate authority is formed to conserve the lake. Pahari believes that the first priority should be demarcating the area of the lake within six months. Of the total 332 ropanis of land from Baraha Ghat to Gaura Chautara, only 109 ropanis of land belongs to individuals. Pahari argues that the government should immediately start acquiring the 109 ropanis of land. Second priority, according to Pahari, should be removing the illegal structures built along the lake's shores. “Although the Supreme Court has already issued the order, illegal structures are still being built. The most important task now is to stop building illegal structures,” he said. Pahari also argued that it is equally important to make record of structures built in line with the set standards and whether their owners need to be provided compensation within three months. “We should not make further delay to return 1692 ropanis of land registered in the name of individuals after taking a decision to this effect through the cabinet,” he said. Equally, there is also a need to ensure clean-up of Fewa lake and conduct and start gardening the wetland. “The dam of Fewa Lake has already become old. Since the dam is already in a dilapidated state there is a need to build a one-meter tall dam,” he said, adding that the lake would get a new lease of life if a dam is built between Chankhapur to Mohare and making a provision to send only clean water into the lake.